The Humane Society of Tampa Bay rescued 10 Havanese mixes from a hoarding situation in Temple Terrace. 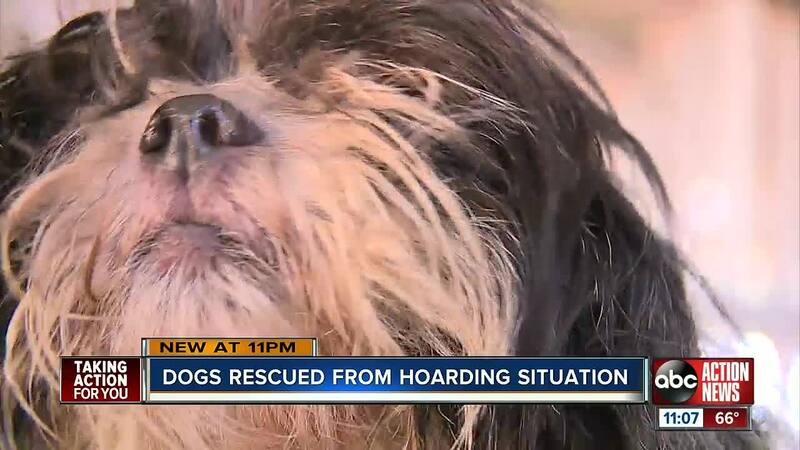 TAMPA, Fla. — The Humane Society of Tampa Bay rescued 10 Havanese mixes from a hoarding situation in Temple Terrace. The dogs had access to food and water, rescuers say. But they had matted, tangled fur and smelled of urine and feces. "They have just caked on feces and a strong smell of urine in their coats. It's just so thick," said Dana Johnson, Foster Care Coordinator with Humane Society of Tampa Bay. Hillsborough County Animal Control, a division of Pet Resources, is investigating the case. A spokesperson with the agency said no charges have been filed against the pet owners. Investigators believe the couple, who willing gave up the dogs, let the situation get out of control. "In over their heads with their dogs. I believe only 1 dog out of the 10 was neutered," said Johnson. Shelter officials said the dogs appear to be in good health, except two of the dogs who both have ulcers in their eyes. "We automatically treated everyone with flea prevention to just kill anything that might have been scratching on them," said Johnson. The Humane Society placed a post on Facebook asking for groomers to help. Emilie Desrochers, a groomer with Petsville Citrus Park, responded and volunteered. She will be one of several volunteers who will clean the dogs on February 9. "I think it's amazing everybody is trying to pitch in and help find them homes and help get them cleaned and ready to go. Even in the pictures where they are all dirty, they are still super cute. I can only imagine how gorgeous they'll after and they are going to get adopted right away," said Emilie Desrochers. The dogs will likely be available for adoption next week. Animal Control officials said they will return to the home where they found the dogs for a follow-up inspection next week.